Orecchiette is a distinctive type of pasta from the Italian region of Puglia, the southeastern region that forms the heel of Italy's "boot." 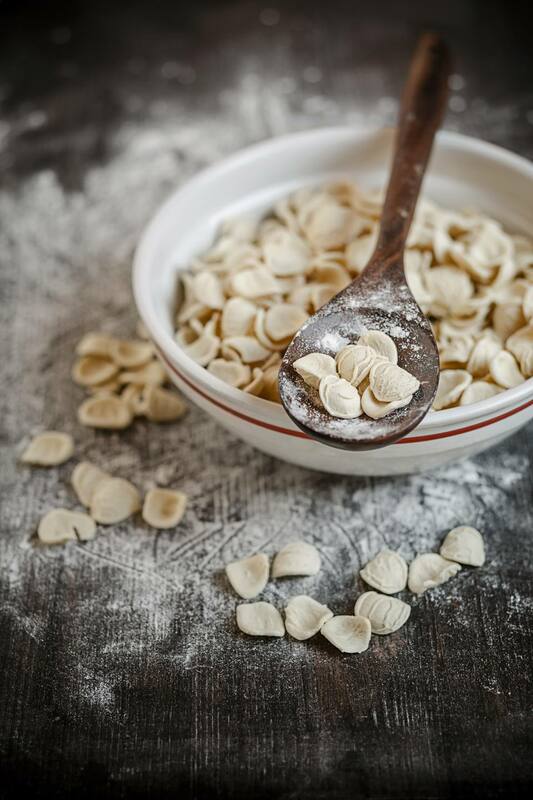 They are shaped roughly like small ears, hence the name (orecchiette means "little ears"). They're a bit less than an inch across, slightly dome-shaped, and their centers are thinner than their rims, a characteristic that gives them an interesting, variable texture, soft in the middle and somewhat chewier around the edges. They are best in the fresh version, though dried versions exist as well. In discussing them in La Cucina Pugliese, Luigi Sada says, "making them takes experience, ability and practice," an observation that leads to the conclusion that you might prefer to buy them ready-made. This is a much easier proposition than it was even ten years ago -- Italians living in other parts of the Peninsula are discovering the Southern Italian cuisines and as a result, there is a market for southern specialties; the major industrial pasta producers such as Barilla or Voiello have joined the small artisan shops in making them. As a result, they are readily available throughout Italy, and the United States as well. When you buy them, check the expiration date to be sure they're still fresh, because older orecchiette can be problematic to cook. If you instead choose to make them at home, Mr. Sada says you should begin by weighing out two parts durum wheat semolina and one part flour (to get the proportions right, you really will need to use a scale; we would suggest 1/4 pound/100 grams flour [1 cup] -- and 1/2 pound [200 g] semolina, which will be less than 2 cups in volume). Mix warm water into the flour until you obtain a firm dough, which you must then knead quite well, 10 to 15 minutes. Roll the dough out into finger-thick snakes. Using a knife, cut around the size of a thumbnail and spread it out across the work surface with the knife (the cutting and spreading should be one motion), then flip the pasta with a flick of the thumb; doing so will make the center of the bit of pasta form up into a dome, and the orecchietta is done. Continue making orecchiette until you have used up all of the dough. Mr. Sada also notes that there are large- and small-sized orecchiette, and says that if you do not roll the ball of your thumb over the spread pasta, but rather leave it flat, you will have a cenciono or strascinato, a type of pasta typical of the Pugliese town of Bari, which is interchangeable with an orecchietta in recipes. If you instead just cut the piece of pasta from the snake without spreading it out, you will have a megneuìccje, which would be better suited to soup, along the lines of the Sardinian fregula. In any case, let the orecchiette rest for several hours before you cook them in abundant, lightly-salted water. Orecchiette with Shrimp and Arugula -- Inspired by a fantastic lunch in Rome, this dish, with a creamy tomato sauce, is quick and easy to make. Orecchiette with Broccoli Raab -- This is Puglia's signature dish, orecchiette alle cime di rapa. Though in the U.S. sausage is often added, the traditional version is just pasta and vegetables, with a bit of spicy dried red chile pepper. Orecchiette with Meat Sauce -- A hearty dish with a ragù made with several types of meat and red wine. Orecchiette is also often served in Puglia in a simple tomato sauce, or together with small meatballs. They work particularly well with vegetables, or any type of sauce that's in small chunks.